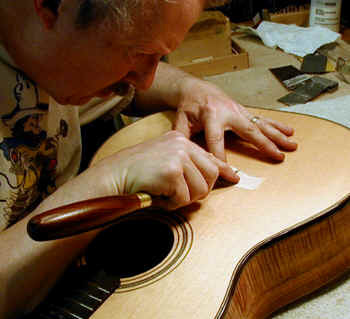 Gluing on the bridge is one of the most common jobs for a guitar maker/repairperson. 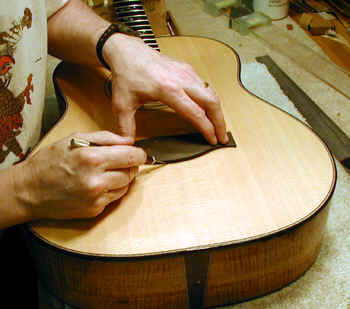 Obviously it must be done for every new guitar, and frequently is done as a repair on existing guitars. The techniques are essentially the same in any case. Here is how I do it. The first step is to carefully locate the bridge on the top. It must be centered (you can just see my center mark in the photo. I bought a centering ruler just for this, and love it). It must be the correct distance so the saddle will be correctly located. For me this is relatively easy since I cut the saddle slot after the bridge is glued, but either way it is a simple matter of measuring correctly. 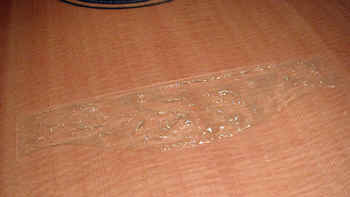 I strongly recommend buying a very good ruler -- preferably about 24". I use a Starrett and their quality is a comfort to me. It is also important in locating the bridge to ensure that the straight front edge of the bridge (at least in my design) is perpendicular to the center line of the top. 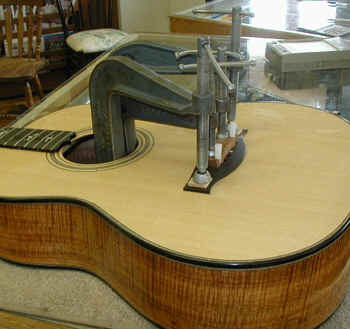 If it is not perpendicular, the guitar will look lopsided. After I have measured this several times, I lightly tape the bride in place and hang it on the wall. Then I step back 10 paces or so and see how it looks. This turns out to be a very accurate procedure. After the location is certain (remember the old saying "measure twice, cut once. "), I scribe around the bridge with a fine exacto blade, being very careful to make my line very exact. I cut through the lacquer, but not the top. If the knife blade is gently heated in a blowtorch, it will cut with less likelihood of chipping the lacquer. The next step is to remove the lacquer. I use a semi-paste stripper to remove most of it. Of course there are other ways. Some makers apply masking tape (or even a thin plastic "mask") to the top where the bridge will go before finishing the body, which then can be easily removed. The lacquer can also be removed with a router set to cut only that thickness. Like most of what we do, there are many ways to skin the cat. I continue to use this method largely because of habit and familiarity. After most of the lacquer is removed, I very carefully finish the job with a very sharp chisel, making certain that all lacquer inside the scribed line is gone. Then I carefully sand the wood to remove any traces of lacquer or stripper. 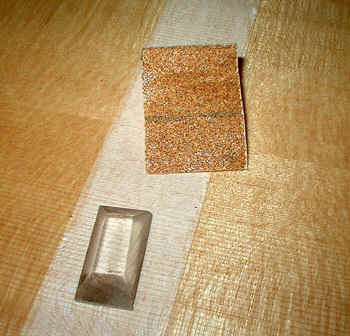 I made a small sanding block out of Plexiglas to ensure that the wood stays absolutely flat. 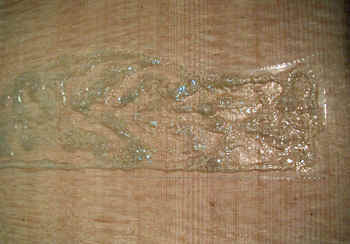 After the finish is removed I carefully sand the wood (with a 100 grit paper) to ensure that it is flat, smooth and that no traces of the stripper remain. I made this small Plexiglas sanding block just for this purpose. 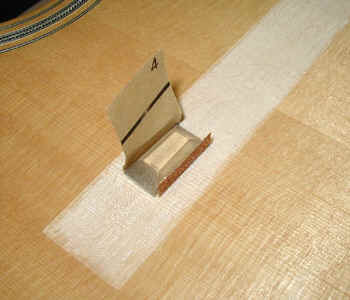 This caul fits inside the guitar to provide a good surface for the clamps to rest without damaging the top or braces. As you can see, it is cut out to span the braces. I have one for each of the various designs that I use. Finally, I glue on the bridge. You can see that I use plenty of clamps. 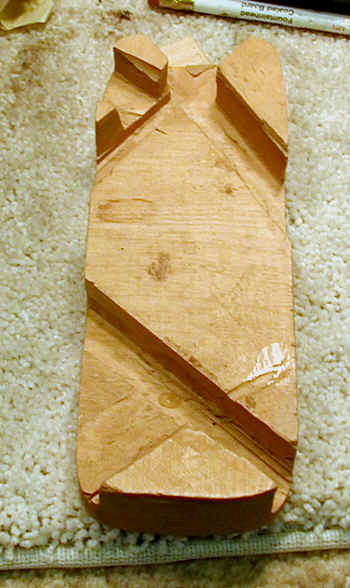 There is a caul inside which bridges over any braces (see above), and the caul on the center of the top of the bridge is carefully shaped to fit my bridge. The pads on the ears of the bridge are spruce so as not to mar the bridge. Apply glue, clamp and then carefully wipe off any squeeze out. While I use plenty of clamps, and want a good tight joint, one must be careful not to apply so much pressure as to caused a "starved" glue joint. More of the same. these days I am using hot hide glue to glue on bridges because I believe that it is a stronger glue and less susceptible to heat. this means one has to work very fast. I use a couple of tapered pins to quickly locate the bridge and a vacuum clamp to make the initial contact. After about 5 minutes of vacuum clamping I can remove that clamp and put the C clamps on. saves wear and tear on the vac clamp.